2. If you are not comfortable installing the Radiance mod manually, this is probably not the download for you. It requires you to go muck around in the Program Files. It has always frustrated me when custom lamps that look like they should cast candlelight cast electric light instead. I mean it really bugs the crap out of me, I can't even tell you. When I found out there was a way to adjust the color each individual custom light casts, I was overjoyed... until I found out it didn't work for me. It took me some thinking, but eventually I realized it might have something to do with the fact that I use dDefinder's update of Gunmod's Radiance Lighting Hack. As it turns out, the way the Radiance mod deals with custom lights is to inextricably link them to the Maxis light they were cloned from-- which means the extracted Castaway Stories lights will forever emit bright electric light, even the ones that have obvious fire leaping up from their coals. Then I said to myself, "Wait, some of the Maxis lights are all flame-colored-y, maybe it's possible to mod the mod and get the lighting I want!" It turns out it totally is. None of these pics have been retouched in Photoshop except to crop them (and once, to combine two photos taken from the same angle to eliminate speech balloons). Candle-lit dining hall, although a small hall. Brunette in the foreground is wearing one of Pooklet's frekled skins, the alien teen in the background is wearing Ivory Tattoo by Chakaru, and my wicked witch is wearing Phaenoh's lighter overlay. The guy's hair glows like that under any light but sunlight, I haven't figured it out (but I'm only keeping that hair until I steal its alpha anyway). So I gathered to me all of the base-game floor, ceiling, wall, table, and outdoor lamps that don't emit a special-effects kind of light (because you never know when you're going to need blue or green or red light, or whatever, for a set or scene) and set them to emit a light called 'candleflame.' To see an in-game example of candleflame light, check out the Torcher Luminescence Sconce. Practically, what this means is that any custom light cloned from the thirty-seven base-game lights I fiddled with will now glow warmly with fire's warming glow. Unlike my hiders, you cannot cherry-pick which lights you want fiery. It isn't exactly whole hog or none-- more on that later-- but you can't decide you only want one of the base game floor lamps to be candlelight and plop that file in your game. I'm sorry, but making the Radiance mod read each lamp as an individual file instead of in the EP-specific lumps it was designed for is well outside my ability as a modder. It is entirely possible to change each light to the light color of your choosing (within available options), but it's not something I could feasibly offer up for download. Non-electric themed games, mostly. I play Medieval, but I could see this look being of use to folk who play anything before the electric light, which ranges from Discovery Of Fire to Gaslamps Are Everywhere. Medieval, Regency (or Victorian, but I see a lot of Regency games), Fantasy, and even Post-Apocalyptic themes could get some use out of this tweak. Or, you know, if you just like a warm, romantic light, or want to tear my changes apart to make your own, that works, too. This Tweak is Easy to Screw Up! Seriously. Seriously. If you are not comfortable mucking around with the Program Files folders, either get comfortable or do not download this. None of the files go in your Downloads folder, this isn't a standalone mod but a tweak to an existing mod, and it will overwrite parts of dDefinder's mod. I do not believe it will break your game-- the Radiance Lighting thread suggests the worst a bad install will do is give you the Red Graphic Death, which is easily fixed by correctly installing backup Maxis lighting-- but it's still pretty easy to try to put this in the wrong spot. Reading one of my book defaults. I should make an illumination pun. Bedding is off-white, hair is Incendiary. Walls and floor by Sherahbim. The Zip file includes reference photos, a list of exactly which lights have been altered, installation instructions, instructions for tweaking your own lights, and one text file each for altered Base Game floor lamps, hanging lamps, outdoor lamps, table lamps, and wall lamps, Family Fun Stuff lights, Bon Voyage lights, Celebration Stuff lights, Mansion and Garden lights, Pets lights, Seasons lights, and Teen Stuff lights. You should not install lighting files for expansions you don't have; also, changing expansion lighting is completely optional-- if you want all your base game lights to be flamey but everything else to be as dDefinder intended, more power to you. Unfortunately, cherry-picking by expansion is the only cherry-picking you can do for this mod. Also included are updated versions of the Sims 2 Store Castle Stuff lights, the Beacon of Brightness floor lamp and Fleur de Luce chandelier. Originally, these cast a bright white light, but their internal .nlo files have been updated to give them fire. You can use these two lights (if you have Apartment Life, Mansion and Garden, Sims 2 Store Edition, or one of the newer bundle packs) even if you don't install the rest of the mod. You will also get a backup of dDefinder's original files for the files I altered, but I will not provide a Maxis lighting backup or a full copy of the Radiance lighting mod itself. These files are not compressorized, because they don't need to be. Okay, first (assuming you are the administrator on your Windows account; Mac users, you're on your own), go download and install Gunmod's Radiance Light System 2.4 Updated by dDefinder following dDefinder's directions, if you haven't already. If you're a newcomer to Radiance lighting, you might want to delete your cache files and start your game to revel in the pretty, and to be sure you installed the mod correctly. You may have to re-buy lights to make the changes show up, but that hasn't been my experience. Lights and temple from Castaway Stories, outside at night, so that the shrine is backlit. These lights put out a cold white light before, despite containing actual fire. Before we get to the download, I have two comparison shots and a list of what lights have been altered for you. Yes, I forgot to switch out the Sims 2 Store lights for their unmodded versions, but I always manage to screw up something. Pics of the C-C-C-Chandelower, Helier's Streetlamp, and Tri-Luminlight Streetlamp are linked from their names, because they're super-awkward to photograph the same way I shot all the other lights. 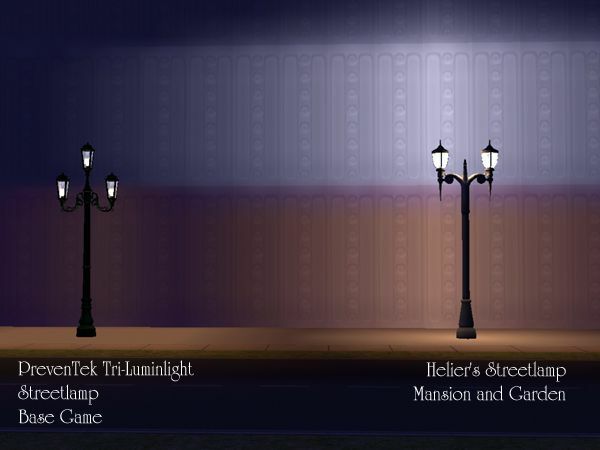 No matter what I did, I couldn't get the Helier's Streetlamp to behave properly; I'd suggest placing it far enough away from second-story walls that the splot of white light doesn't show up. 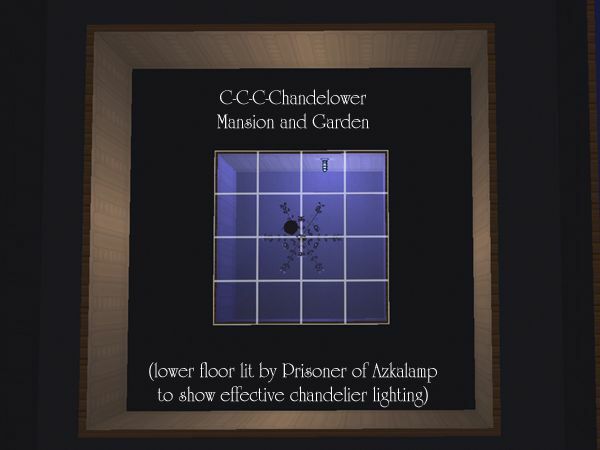 Yes, the C-C-C-Chandelower is a mess as far as lighting goes; it lights the second-story walls but not the second-story floor or anything on the first story. This is how Maxis designed it to work, and dDefinder couldn't fix it. Admittedly the floor lamp tiki torches were always fire, but I'm showing off examples of the lighting anyway and I really love this shot. and our own Eva, for saying DO IT or nearly so (more like SHARE IT) at a key moment. A surprisingly mean Good Witch, with fair skin, Volatile hair, and a lovely cream dress by Sherahbim, sitting in a white-and-gray throne against a gray stone wall. Photo taken after dark in a very, very well-lit room. Also feel free to hit me with questions, I shall do my best to answer them. ... Huh. That's never happened with me with the Store stuff-- weird. But good to know, because if it happens in one person's game, it could happen in others. I'm glad you like the lights, though! I admit I thought once or twice "I bet Morgaine could get some use out of this one" as I was banging on things and trying to make them work. I remembered reading somewhere you'd said you got Radiance working, but I'll be damned if I can remember where. But really, Hat, I can't thank you enough for this. You always have the best ideas, and manage to make them happen too. Yay, I have Eva's approval! Finish studying, then play games. It always works out better that way. You are totally welcome, thank you for encouraging me to share (even if it turned out to be easy once I knew what I was doing). Now if only my aging mod gave me some low-end elder lifespans. *frowns at old ladies* Most of my handy dandy testerhouse is going to kick it around 72. Which is average, but it's not much variety. Dang, that is in fact a long time-- two weeks! I'd go nuts, if only because I always go nuts when I say I can't X for Y time. Even if I've gone Y time without X plenty of times before, making it a rule gives me cravings for X. 72 is about human average, actually. Medieval average was lower for several reasons-- if you made it out of early childhood alive, you could easily make it to fifty or better... if your lord didn't grab you out of your fields to come fight in a battle you weren't at all prepared for. If you were a man. If you were a woman, every pregnancy was taking your life into your own hands-- but if you survived until menopause, you could be old for a long time. And I do wish infant mortality were possible for Sims-- apparently there's a hidden toddler death-by-electrocution animation somewhere, but nothing for babies. The only way I know of to kill an infant is the babbyroaster, and while part of me wants to make an invisible recolor so I can set up some kind of sacrificial altar, a) none of my in-game cultures really have room for a Moloch and b) that is so far from death by whooping cough that it isn't even funny. Couldn't help myself, I just had a quick look in game. It does look beautiful, the lamps give everything such a warm glow. Yes, that's what I thought. Once you made it to being 'old' you could probably get quite a lot older. The problem was getting to the 'being old' stage. We should totally have some sort of mod that gives you a dialogue at birth like with the trips and quads hack, except it should say 'Let mother survive, let mother die, or random.' Same for the baby. And one for when babies age up to toddlers 'Age, die, or random.' That is, of course, if it were at all possible to mod the game so that babies could die. Maybe I should make a request at Simbology some time, even if it's just to find out for sure if it could be done or not. They DO, don't they? I took a buttload of pictures and hardly used any... firelight on either side, but moonlight from the front. Exactly. There were kind of a lot of things that could kill you. Well, there are still a lot of things that can kill you, just new things. Cars, motorcycles, airplanes, busses, trains, allergies, cancer, AIDS, falling from the top floor of apartment buildings, guns, bombings, chemical weapons, ... it's actually kind of surprising we live for so long when you think about it. Well, we DO win a lot of Darwin Awards... But we also keep making things safer. That's entirely reasonable. I'm just trying to think how it would work... Maybe four choices on one card so you don't have to have two extra pop-ups per birth? "Childbirth is serious business! There are no guarantees that everybody will make it through the experience. |Mother Survives (roll dice for Baby)| |Baby Survives (roll dice for Mother)| |Roll Dice for Both| |Ignore (both survive)|"
Granted, it wouldn't make it easy to kill babies off for storyline purposes, but that's easily solved the same way you solve needing a boy or a girl for storyline purposes can be solved-- save before the birth, then exit without saving until you get the result you want. *does quick research* Looks like death by birth or complications from birth is generally accepted at around 20% at the highest for mothers... Infant mortality is guesstimated at 30-50%, but that's for the first year of life, not the first few minutes. Enough of my whinging, I think you've done a fantastic job with this. The lights just look so much more, warm now. Thank you so much, and hold on for a hair dump one of these days-- I've got a couple hairs I want to finish and a whole mess of swatches to make. Swatches take more time than you'd expect. Anyway, splendid stuff, Hat - your ingenuity never ceases to amaze and impress me! Well, I think it is! I like a nice warm light, even if it doesn't give the same true colors a white light does. Awesome! I love how warm and glowy the lights look. :) I'm so going to use this in my (sort of) post-apocalyptic neighborhood! Quick thing about speech balloons--there is a cheat to get rid of them, but I can't remember what it is because it requires an EP that I don't have (although you probably have it). I think it's "showheadlines off" or something to that effect, but I'm not sure off the top of my head. What I do instead is just use the InSim wardrobe adjuster: if you've got a sim with a speech bubble or a relationship plus/minus or a memory or whatnot floating above their head, just click "Change to Everyday (or whatever the sim is wearing at the time)... [Sim's name]" and any overriding icons will vanish. The corresponding Blender function would probably work too. Thank you so much! I'm glad you like it, and I hope you like how it looks in-game. I do know about the cheat, but I was already in camera man mode and I liked my angle-- it was easier just to take two pictures at different moments and erase the bits that spoiled my first shot leaving the nice tidy un-ballooned bits from my second shot than remembering how to save my angle, doing that, entering a cheat, and taking pictures all over again. Is your mod dependent on GunMod's original lighting system, or do you think it would work with Aaron's Ambiance mod? I've never seen Aaron's Ambiance mod, so I'd say it's safe to say it wouldn't work with it. The files in my mod are just files straight out of dDefinder's edit of Gunmod's mod-- it's not a standalone mod, just a tweak to an existing one. I swear my files are worth downloading just for the Seasons file. I'm so glad you like them, and that you're getting your period game going again! I am a period player, have been since the start of Sims1, Medivael being my theme of first choice. All of your defaults and mods are fantastic. They are loaded into my game and work wonderfully. I am particularily happy about the lighting. Again, thank you for all your wonderful hard work on the Medivael mods/defaults. Including the Lighting! It's from Castaway Stories! There's a ton of Castaway crap on MATY, but the ruins are from this post specifically-- scroll down a bit, they're in there. (However, the first post? Has some coconut trees for you. Somewhere on InSim there's a mod to make the harvestable trees harvestable for edible fruit instead of just cash or food points, but I haven't tested it enough to recommend it.) I kind of completely love Castaway crap. Fantastic! I have Castaway for the PSP, though I don't own one. My kids do. When we're out and they aren't using their machines, I scarph one up. *chuckling* yupyup. Thank you! I shall check out those links. Your witch wouldn't be the only mean Good Witch; Phoebe Adams has three niceness points, and I believe she has three points in activity, outgoing and playfulness, but zero in neatness. I'd love to mess with her personality file and give her ten activity points, and maybe only two outgoing points - give her a Nervous Subject type personality - and change her aspiration to Family. I've even made a former Cow mascot into a good Warlock, and he seems to be okay with it. Hat, before I try to install this, I was wondering if it works if you have used the Scriptorium method to automatically install the radiance lighting mod? Thanks! I'll be honest; I have absolutely no idea because I've never used Scriptorium. If all Scriptorium does is put the files into the correct places, then there shouldn't be any problems, but I can't know for sure because I installed everything by hand. Ok. Thanks. The instructions say that's what it does. I'll give it a try and post the results here. I gave it a try. All of the files were right where you said. I LOVE this mod! Thank you for adding so much realism to my sim's medieval world. It's amazing what a difference lighting makes! I'm glad it worked! Thanks for letting me know.